Through 1,326 games at the All-Star Break, MLB has seen 95 ejections and 745 Replay Reviews. Most EJ: Sam Holbrook (6); Bill Welke (5); Phil Cuzzi, Paul Emmel, Carlos Torres (4). Perfect QOC (# Ejections): Culbreth (3); Wolf, Scheurwater, Porter, Lentz, Carapazza, Barry (2). Most Replays: Doug Eddings (16); Holbrook, Fagan (15); Timmons, Morales, Layne (14). Perfect RAP (# Replays): Fairchild (4/4); Blakney, Scott (2/2); Hoberg (1/1). 1. Alan Porter - 14 (3 Ejections, 13 Replays). 2. Vic Carapazza - 13 (2 Ejections, 7 Replays). 2. Fieldin Culbreth - 13 (3 Ejections, 10 Replays). 2. Sam Holbrook - 13 (6 Ejections, 15 Replays). 5. 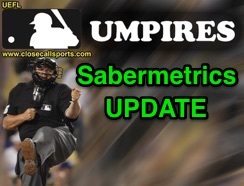 Joe West - 11 (1 Ejection, 12 Replays). 1. Sam Holbrook - 14. 2. Joe West - 12. 3. Jim Reynolds - 11. 3. Mike Everitt - 11. 5. Alfonso Marquez - 8. 5. Larry Vanover - 8. 1. sonderweg74 - 44 (Reynolds -cc, West, Guccione, T Barrett, Porter). 2. cyclone14 - 43 (Holbrook -cc, Bellino, T Gibson, T Barrett, West). 3. BkSl14812 - 38 (Holbrook -cc, Hoberg, Reyburn, Porter, Guccione). 4. skippyINC - 35 (West -cc, Iassogna, Baker, Carapazza, G Gibson). 5. tjskip21 - 34 (West -cc, Little, Porter, Wolcott, Tumpane). 6. Burtrh3 - 33 (Everitt -cc, Layne, Carapazza, West, Wendelstedt). 7. Duke82 - 32 (Reynolds -cc, Everitt, T Barrett, Marquez, T Gibson). 8. KTurner14 - 32 (Reynolds -cc, Hernandez, West, Guccione, Wolcott). 9. L'Ump - 31 (West -cc, Scott, Carapazza, Winters, Kellogg). 10. Mortonkc - 31 (Miller -cc, Culbreth, Segal, Meals, Everitt). 9. Bob Abouy - 29.